January is such a bleak month. It's cold and gray and all of the excitement of the upcoming holidays are long gone (even if it's only been a week!) and there's nothing to look forward to until Valentine's Day. I needed a project to cheer myself up. 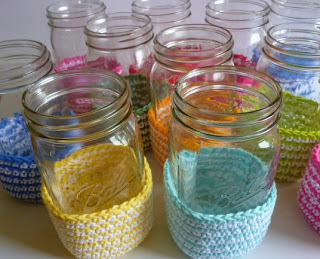 I made some brightly colored mason jar covers to brighten up the kitchen. You guys know my love of mason jars. In fact, I would rank my metal punch as my #1 craft purchase last year, just so that I could add straw holes to the jar lids and make 'to go' cups. Dishwasher and microwave safe, AND environmentally friendly?! Awesome! Add on some covers to serve as a way to identify who's cup is who's and it's a perfect party cup too! I use the wide-mouth quart sized mason jars, because who wants to have to keep running back and forth to the kitchen all the time for refills?! The only one who uses the smaller pint-sized jars is Mims, because I'm afraid if she drops a giant jar of sweet tea on her toe she'll break both the jar and her toe! This pattern is for a cover for the quart-sized jars. I used cotton yarn so it would be absorbent and could be tossed in the washing machine when needed. Fasten off. Weave in ends. 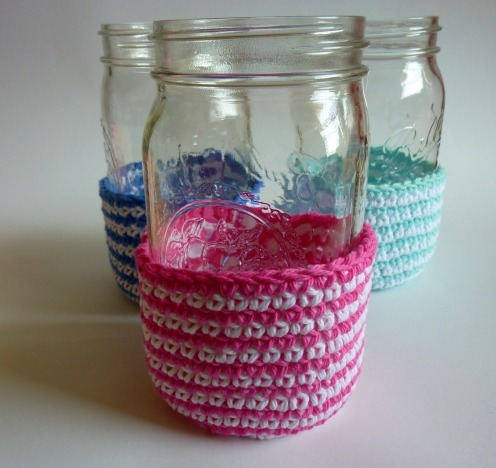 Put it on a mason jar and you don't have to worry about using a coaster! So go check out the newly updated recipe, if you're into iced tea, because it's my go-to beverage of choice, once I've gotten my 8 cups of just plain water in for the day. 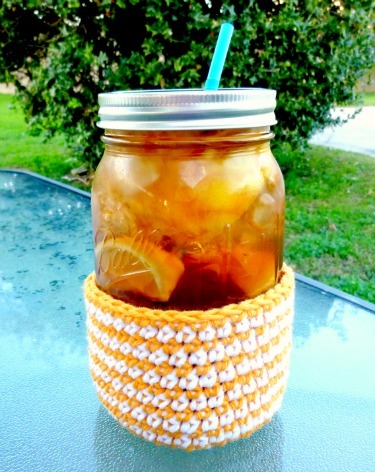 The mason jars look cute holding water too, so if you drink 2 of the big jars of water in the morning, you can enjoy your tea all afternoon! :D The lemon slices are completely optional! I like your mentality.When it's dark and grey and all the holiday excitement is gone just start creating beautiful little things!Great uplifting attitude. Thanks Angie! I'm glad I'm not alone with my sunshine-y thoughts! shout out Jaaaaaaaime :) Linked back to you. arrrrg Jaime help lol where is the tutorial for your jar lids? Renee, I just used a metal punch to put a hole in the metal lids that the jars come with! LOL!!! Best 30 bucks I ever spent. lol can you e-mail me a pic of it so i will know what to look for lol. LOL!! I got mine from Amazon! I love Amazon almost as much as I love Target. I think that 50% of our income is spent in those two stores! I love it, although, I did catch my thumb between the handles once while I was punching a lid and bruised the heck out of it! LOL!!! It's dangerous being a crafty gal! Hello, these are adorable! Any idea approx time it takes to make one? I would love to make these as my next project, thanks!! Hi Katie! I am a speed crocheter, so they're pretty fast for me, maybe 15 minutes? I did the whole project (all 12 jar covers) in an evening while I watched documentaries. I feel like a very beginning crocheter could finish in less than an hour. And it would take much less time for an experienced crocheter! LOL!!! lol...well then I should be done with one in just shy of a.....WEEK! hehe. I'm am turtle speed at best. But I am very excited, and hope to get faster now that I have a little more time on my hands! thanks for your reply! rofl Jaime can you see us 2 speed crocheting together..
Email me your address, Renee. Actually, what I'm really interested in is a hint on your sock pattern. Can you lead me to a simple and fun pattern? Hi TJ! Hmm, good question. I would make the base circle at the beginning a little smaller (like maybe try leaving out Row 6 - or even R5-6) and then do a couple of the going-up-the-side rows and see if it fits your jar snugly. How fun! Good luck!